Magply boards create walling solutions for student accommodation .. 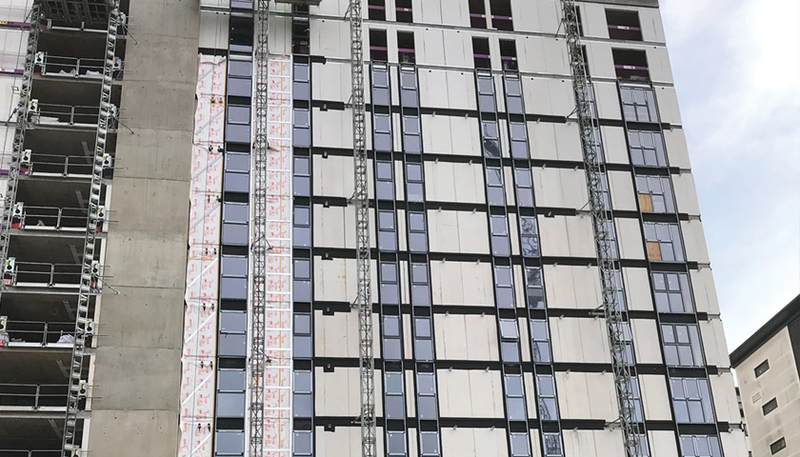 The high-rise Oxford Point development in Bournemouth for Fresh Student Living is making full use of the technical benefits to an innovative BBA approved structural walling system, which features 9mm Magply boards for both the inner and outer faces to the insulated panels’ design. While many such composite walling solutions use OSB or particleboards to sandwich a foam insulation core, the MIB MetSIP is much more robustly engineered, with 75 mm deep cold-formed steel Sigma studs – plus a 45mm treated timber packer – at 600mm centres. 9mm thick Magply modified MgO boards form the inner and outer skins to the 136mm thick panels, whose excellent U-value is provided by a CO2 blown polyurethane insulation. To find out more about walling solutions by Magply, please click here.